Just don't push your luck. A year ago I wrote about Wuss Mode, a popular fan-made mod for SOMA that makes its monsters harmless. It’s currently the game’s most subscribed Steam Workshop mod, which suggests a lot of people want to experience its dark, twisted story without the frustration of having to play hide-and-seek with biomechanical monstrosities. But come December 1st when the game is released for Xbox One, you won’t need a mod at all. The PC version will be updated at the same time with an official Safe Mode designed to let players enjoy the game without the constant, looming threat of death. 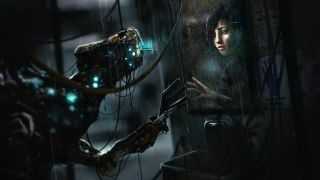 “I’m all for users modding the experience to suit their needs,” says Thomas Grip, Frictional Games founder and director of SOMA. “The monsters in the game are quite divisive and you could argue that Wuss Mode intends to fix a design flaw. If you think of it that way, I guess you could see the mod as a critique directed at me. But I have a hard time getting upset about that. I just really like it when people take things into their own hands like this." I’m actually surprised by how well it all turned out. It fits the game far better than I thought it would when we started working on it. The monsters won’t just stand around doing nothing either, and might even attack if you annoy them enough. “So while you can’t die, the monsters may still be dangerous if you push your luck too much,” says Grip. “This means there’s still a sense of hostility in these creatures, which preserves the original intention of making the world feel inhospitable and oppressive. It’s details like this that should make Frictional’s Safe Mode more compelling, and more naturally integrated, than the Wuss Mode mod. Although it’ll be interesting to see how it gets around that fraught moment in the wrecked ship. I’ve finished SOMA twice now, once as the developer intended and once with Wuss Mode installed. But I’ll be playing it again when Safe Mode is added to experience Frictional’s official take on a monster-free game. The story in SOMA is, for my money, one of the best ever told by a videogame. I think about the ending often, and giving more people a chance to experience that for themselves is something I think should be celebrated.